The principal examples of modernist and noucentist art in La Garrotxa are to be found in Olot. And it is in Olot that modernism had a strong influence in the urban architecture. Alfred Paluzie, Josep Azemar, Lluis Domènech and Muntaner, the sculpture Miquel Blay all left their mark in various buildings, such as Mas Collellmir house, the Pastisseria Ferrer, Can Noguer, Pujador house, Escubós house, the side entrance to Sant Esteve church, Gaietà Vila house, Solà Morales house, Riera house, Gassiot house, Sibidí house, Masllorens house and the Pons and Tusquets tower. The most notable piece of sculpture is "La Lectura". The Firal (market place) is home to two of the most important Art Nouveau buildings in Olot. On one side stands the Solà-Morales house, which was included in the European Art Nouveau route in 2000. Plant motifs predominate on the façade renovated by Lluís Domènech i Montaner in the period 1913-1916. The top storey has a gallery supported by 12 decorated columns and a barbican tiled with ceramics from Valencia; also on the façade there are two caryatids by the sculptor Eusebi Arnau. From this house, another of the most eye-catching buildings in Olot – the Gaietà-Vila house at the other end of the Firal – is visible. This lat- ter house was designed by the architect Alfred Paluzie and has medieval elements such as crenellations on its roof. Other Art Nouveau buildings in Olot include Casa Pujador, Casa Gassiot and Casa Masramon, the latter the work of the architect Rafel Masó. This architect also designed Mas la Riba in L’Hostalnou de la Vall de la Bianya, a village that can also boast an Art Nouveau altar piece and entrance door in the Romanesque church of Sant Salvador de Bianya and the Art Nouveau Casa de la Coromina. 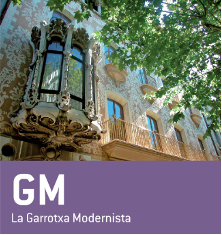 The route can be rounded off with a visit to the Museu de la Garrotxa, where several modernist works are displayed, such as the collection of posters from the Cigarrillos París competition. Art Nouveau also made its presence felt in the Hostoles valley. In Sant Feliu de Pallerols Can Casas is decorated with coloured glass, painted ceramics and worked wood and iron, which dates this building – today a chemist – from the beginning of the 20th century and the end of the Art Nouveau period. In the neighbouring town of Les Planes d’Hostoles, the first Art Nouveau building you will find is the school, opened in 1918. It stands on the left-hand side of the road from Sant Feliu and one of the peculiarities of its façade is that the signs that differentiate the boys and girls entrances are still visible. A little further along and on the same side of the road stands Can Garay, converted into a hotel with an Art Nouveau ambience to mark its centenary. Continuing on towards Girona, we find Torre Dusol. It was built between 1920 i 1922 and today a well-known restaurant and conference centre known how Torre dels Til·lers. Other buildings in the town that are reminiscent of Art Nouveau include Can Cadet and Can Noguer.